Festive and super fun Christmas Advent Calendar Bag set featuring classic images from the Christmas season! Each image is absolutely adorable and it just might be our favorite Advent bag set! 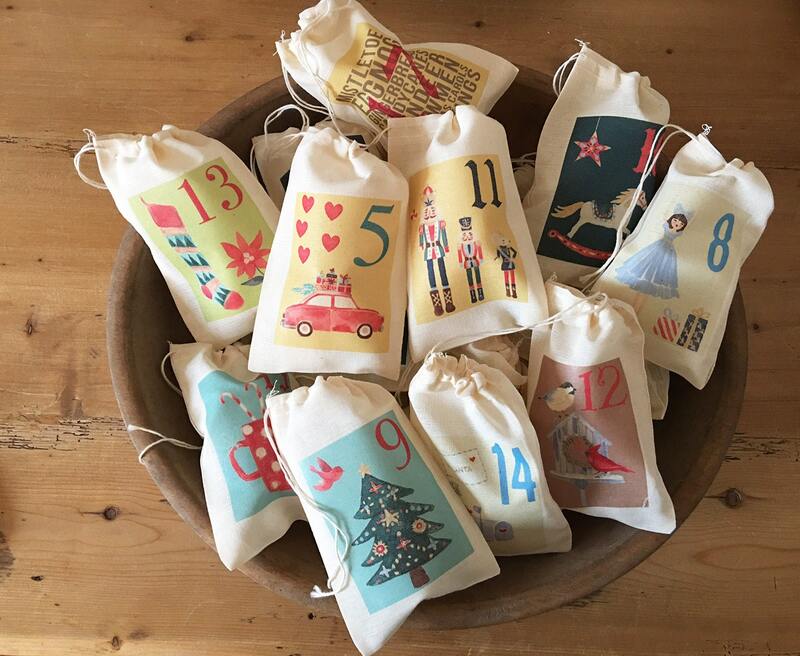 Enjoy each bag for all 25 days until Christmas! Also makes a wonderful gift! With this purchase you will receive 25 Festive themed Advent Calendar bags, each bag has a unique classic Christmas design and is numbered 1-25, to count down the days until Christmas morning. Our 3x5" or 4x6" inch bags are perfect for placing small gifts like toys, notes, candy, gift cards, jewelry, ornaments and so much more! Use this set year after year! 4x6" size in the picture above. Bags can be displayed on a fireplace mantel, a bookshelf, in a Christmas basket, hung with twine and clothespins, or take one out each morning at breakfast as a surprise! Wrap your gift in tissue before placing in the bag for a fuller appearance. Our bags are washable, 100% organic cotton muslin, with a drawstring closure. Muslin fabric is a delicate, loosely woven cotton. We use the very best professional fabric printing equipment. We NEVER use "iron on" materials or stamps that fade away or run when wet. It is exactly what I needed for our advent calendar! Perfect condition and size! Kids loving them! Just the right size for a small surprise each day. Absolutely love these! The kids have so much fun looking at the images on each bag and looking to see what surprise is inside. We accept Credit Cards, Etsy Gift Cards, Paypal, Check or Money Order. We guarantee you will be completely satisfied with your Kport Gift Company purchases. If there is a problem with your order, please contact us. Notify us within 14 days from date of receipt to return or exchange your item. The returned item should still be in its original condition when we receive it. Personalized or custom orders are not returnable unless we can resell the item. Orders are shipped via USPS 1st class mail or choose a shipping upgrade at checkout for Priority Mail or Express Mail. All orders have a delivery confirmation number. We offer many different sizes of drawstring bags and totes. View the size options and prices in each listing by using the dropdown box to the right. Please note: All our bags are hand-sewn, so the measurements may vary by up to a half an inch. If you're not sure about the size, please order the next size up, or contact us with your exact measurements prior to ordering, and we will do our best to help you find the correct size. We love special requests and custom orders, let us know if we can make something special just for you! Can each bag have a different name or message? Absolutely! Each bag can have a different name or message. When you checkout, add your information in the "NOTES TO SELLER" section. Advent Bags/12 Days of Christmas bags can not be personalized. Is personalization included in the price? Yes! Personalizations are included in the price of the bags, no extra charge. When you checkout, leave all of your personalization instructions in the "NOTES TO SELLER" section, and we will add it to your order. Can I order a different amount of bags? Yes! Just contact us with the amount of bags and size that you would like. We will then send you price information and set up a custom order link for you to purchase. How long does it take to make the bags? It takes us 3-5 business days to make the bags. If its a small order we can usually ship within 2-3 days. Larger orders may require some additional time to get completed. Contact us if you need your order right away, we are always happy to help. We ship USPS (United States Postal Service) for all shipments. We offer 1st class mail standard shipping with tracking available for all shipments. Priority and Express mail options are available as an upgrade when you checkout. All international orders are shipped via 1st Class mail international. Can you please call me about my order? Sorry, no. Email correspondence only.